Our year-round great weather is amazing—except when stinging insects interfere! One of the draws to moving to the Tampa, Florida area is the amazing weather that permits thoroughly enjoying outdoor living spaces throughout the year. If you and your family are instead being driven indoors because of swarms of stinging insects, we want to help! 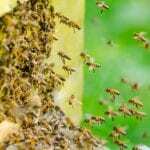 Here at Florida Bee Removal we have provided quality removal and management services for a variety of stinging insects for more than 55 years. With roughly 300 to 400 bee removals each month, it is safe to say that we are your best bet if you are looking for an experienced professional. We were the first in the state to offer bee removal services and we have subsequently trained others throughout the years. We have engineered effective methods for transferring these and controlling other stinging insects that are safe for you, your family, and your pets. We continue to stay involved in the industry so that we can always be certain to offer you the state-of-the-art services that you deserve. We are equipped to handle all species of stinging insects, including bees, wasps, yellow jackets, and hornets. We are knowledgeable and experienced in the various types of each species and what it takes to properly relocate or control them. We take an active interest in protecting those bee species that are vital for human life thanks to their pollination contribution to food production. If you have questions about stinging insects and would like a detailed plan on what we can do to eliminate them from being a problem at your home or business, don’t hesitate to call us. We take the time to talk to our clients and learn what their expectations are so you can be confident that you will get the results you desire. Call today to learn more!